Launched: 2013. Just like with our Lemonades, we wanted to carry our “Taste of the Islands” feeling into our Limeades. What better way to do this than to use the most recognized tropical fruit, pineapple! Pairing this perfect tropical flavor with the sweet taste of a peach makes Pineapple Peach Limeade a truly special flavor experience. 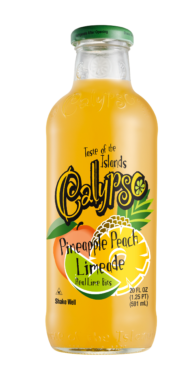 The original, and now famous, Calypso Lemonade recipe was created in 1985 in Milwaukee, Wisconsin, by the owner of the King Juice Company. The idea was simple – make an authentic, delicious lemonade made with real lemons and real sugar. We made the lemonade in small batches and delivered it locally on the company truck. Through the years, our Original Lemonade grew in popularity. Bolstered by the response to our lemonade recipe, and inspired by the fruits, flavors and spirit of The Islands, our Original Lemonade was given the name Calypso and grew into four lemonade blends. Today, Calypso Lemonade has evolved into eleven unique Lemonade combinations, five Limeades and four Teamonades – all of which are based on our Original Lemonade recipe. Each Calypso flavor is produced with a focus on quality – using real fruit, real sugar and natural flavors.